India vs New Zealand 1st T20I: The DRS again stole the limelight after Krunal Pandya trapped Daryll Mitchell in front of the stumps. India vs New Zealand 1st T20I: The DRS again stole the limelight after Krunal Pandya trapped Daryll Mitchell in front of the stumps. Krunal appealed and the umpire raised his finger. Mitchell felt he had got a nick on that and opted for the DRS. The DRS was used, which wasn’t conclusive and it showed the ball was hitting the stumps. 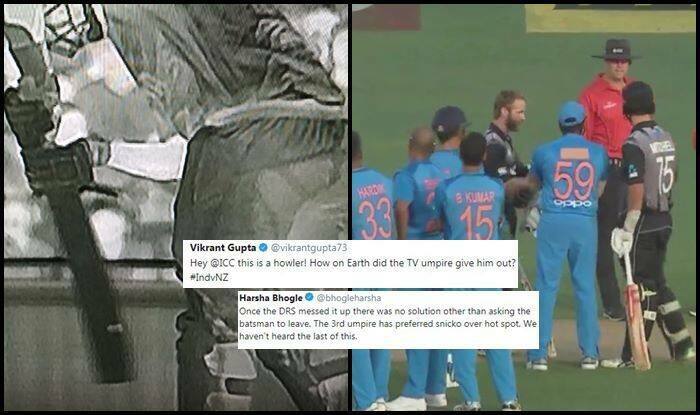 The third umpire preferred snicko over hotspot which is not a common practice and that is what is creating the hullaballoo. Daryl would feel he was robbed after he had to depart for 1. Mitchell was caught in the crease as he went back, the bat came down hurriedly as he jabbed at it. In the meanwhile, Krunal Pandya has already picked up three wickets. The Blackcaps are 110/4 in 14th over. Grandhomme is going great guns and Ross Taylor is looking to settle in and get set for the final onslaught.